Whether you’re building your home from scratch or have come to that time where an old roof needs to be replaced, you should give some thought to your choices. It’s too easy to think of a roof exclusively for its functionality; it also has aesthetic value, contributes to your home’s curb appeal and resale value and is quite literally the top-off touch to all the rest of the work you’ve done to make for a great and beautiful home. Roof shingle colors can be an important consideration. If you’re mulling over the options in shingle colors for roofs, we hope these tips on selecting the best roof colors help with making your best choice. 1. There certainly are dozens, possibly hundreds, of shingle colors you might want to choose from. Remember, though, to never select shingle colors in a show room. You have to judge them in their natural environment. Try to get free samples and if you need to even buy a few in various colors so that you have time at home to mull over their looks in relation to your home and under various weather conditions. The color options spread from black through a range of greys, browns, blues, greens and reds. While sometimes the “what feels right” test is all you need, another important consideration may be the style of your house. Below are some suggestions. 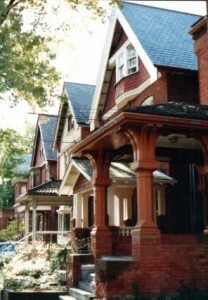 Most Victorian homes were built of clapboard and painted. Give the complexity of the roofs, you are likely better serve by selecting a subdued color. If though the roof is a simple style, you can step it up a bit without risking a clash between roof and walls, windows and so on. These style homes generally leave a lot more latitude in color choices. Often, in fact, a slightly more flamboyant choice can add charm and flair to an otherwise simple design style. Bring the color wheel along and let your imagination go. The expansive, spread out style of these homes involves the roof being closer to the ground. This condition requires a keen eye for selecting shingles. The outdoorsy feel of such styles may well recommend keeping your color choices within nature’s more “woodsy” palette. The wide eaves and porches on these airy and comfortable homes often make the roof a major feature. Again, assuming the right climate and locale has been chosen for such a design, the sun flowing down upon them the best idea is to keep the shingle colors light and cool. If you need to choose roof shingle colors, there are many things to consider. Mulling over the options in shingle colors for roofs, we hope these tips on selecting the best roof colors help you make the best choice for your home.